November 21, 2018 -- The global ultrasound market is on track for a strong year, with the annual revenue growth rate forecast to reach 6.6%, notably higher than the 5.1% growth we predicted at the start of the year. The Europe, Middle East, and Africa (EMEA) and Americas markets are forecast to grow at midsingle-digit rates, slightly faster than reported in our January forecast, with Asia remaining the fastest growing market, largely driven by China. In fact, this year, China overtook the U.S. to become the world's biggest market for ultrasound equipment. Image courtesy of Signify Research. The 2018 growth rate for the United States market has been revised up from 3% to 4% to 5%. Following a market contraction in 2017, the radiology market is forecast to grow at a double-digit rate in 2018, largely due to pent-up demand from the previous year. The release of new premium ultrasound platforms for general imaging applications from some of the major vendors will also boost growth. The cardiology market is also forecast to perform well in 2018, with high-single-digit growth. Following a strong year in 2017, the women's health market is forecast to decline in 2018, due to weaker demand from ob/gyn customers. Breast imaging remains a growth opportunity as ultrasound gains market share from other imaging modalities in both screening and diagnosis. The point-of-care ultrasound (POCUS) market continues to perform well and is forecast to grow at a midsingle-digit rate. The main growth drivers are the increasing awareness and usage of ultrasound in procedural applications, such as anesthesia and vascular access, and the uptake of ultraportable handheld devices in emergency medicine applications. Brazil: Another strong year, but will it last? In 2017, Brazil emerged from its worst-ever recession, and the ultrasound market grew by more than 20%. The cyclical upswing has continued into 2018 with a double-digit growth forecast. While another year of growth is forecast for 2019, the country's economic recovery remains fragile, with many economists calling for urgent fiscal reforms to avoid another recession. With Brazil's public debt projected to rise from today's 75% of the gross domestic product to 82% by 2022, the newly elected president, Jair Bolsonaro, is expected to put pressure on public spending, which will likely impact investment in healthcare. In January, we forecast an uptick in demand for ultrasound equipment in Western Europe on the back of an improving economy. While the market is on track for low-single-digit growth, this growth is by no means uniform across the region. The Nordics and Southern Europe are forecast to be the fastest growing markets, with France and Italy holding back the regional growth rate, largely due to the timing of national tenders. Following several years of decline, the U.K. market is forecast to return to growth in 2018. However, with the prospect of a "no-deal" Brexit looking increasingly likely, this growth may prove to be short-lived. In 2017, the ultrasound market experienced exceptionally strong growth in several of the newer European Union (EU) member states, most notably Poland, on the back of faster disbursements of EU structural funds for healthcare projects and strong economic growth. This year will be another strong one, but the annual growth rate is forecast to drop off in the coming years as the EU has announced plans to shift tens of billions of euros in funding away from central Europe and Eastern Europe to the countries hit hard by the financial crisis, such as Spain and Greece. The Russian ultrasound market grew strongly in 2017, following a period of market contraction in the previous years. The recovery has continued into 2018, and the market is forecast to grow by around 10%, slightly faster than the high-single-digit growth we forecast in January. The Saudi Arabian market returned to strong growth in 2017, largely on the back of improving oil prices. However, this growth was short-lived, and the market contracted in the first half of this year. In other parts of the Middle East, major social, political, and economic disturbances continue to negatively impact the ultrasound market. In our January forecast, we assumed that strengthening oil prices would lead to a recovery in the Middle East ultrasound market, but this failed to materialize, and another year of decline is now forecast for 2018. Turkey continues to represent a growth opportunity in the region, driven by the Turkish government's major reform initiative to transform its healthcare system into a universal health coverage model. 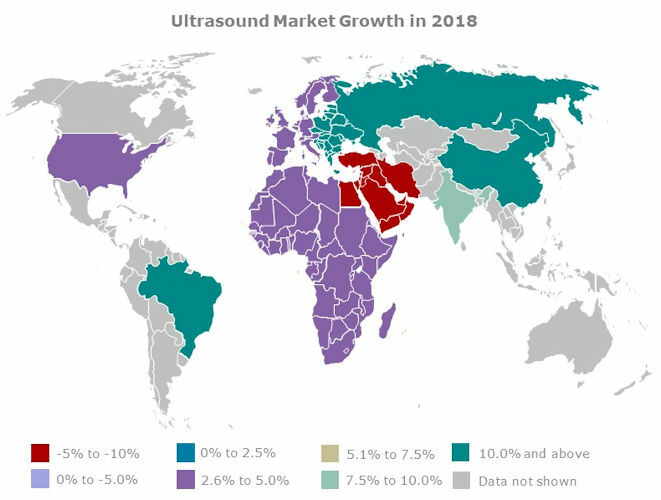 In fact, Turkey is forecast to be the fastest growing market out of the 28 countries/regions analyzed in Signify Research's report on the global ultrasound market. That said, political and social instability remain serious threats to the longer-term growth prospects of the Turkish market, and 2018 is expected to be the peak year for growth. While population demographics, sustained economic growth, and increasing urbanization are all positive factors driving longer-term growth, the African ultrasound market contracted in 2017. This was largely due to the negative impact from regional economic shocks, including the refinancing of the Egyptian economy, and geopolitical instability in some parts of the region. In January, we forecast that the market would grow at a high-single-digit rate in 2018, but this has been revised down to a midsingle-digit rate. In our January forecast, we predicted that the Indian ultrasound market would grow at a double-digit rate in 2018, driven by the government's efforts to expand healthcare coverage, increasing private sector spending, and a growing medical tourism industry. While these underlying growth drivers remain true, we have revised our 2018 forecast to 8.5%. The Indian ultrasound market remains highly cost-sensitive, with most growth coming from the value segment in ob/gyn and general imaging applications. The market for departmental/specialty ultrasound equipment is small and at a very nascent stage, with more market education needed before this potential is realized. A growing population of more than 1.2 billion people, age demographics, and sustained economic growth are expected to drive strong long-term growth for the Indian ultrasound market. India is now the world's third largest economy (in purchasing parity terms), and it is likely to play an increasingly important role in the global ultrasound market in the coming years. As we predicted in January, the Chinese ultrasound market cooled in 2018 after a strong year in 2017. That said, the market is still on track to grow at a double-digit rate this year. Despite slowing demand at level III hospitals, most of which are now well-equipped with ultrasound equipment, there is still ample room for market expansion at tier I and tier II hospitals as the government strives for universal healthcare. In the short-term, China will remain the fastest-growing ultrasound market of all large economies, but with the annual growth rate cooling, it is likely to lose this title to India in the coming years. 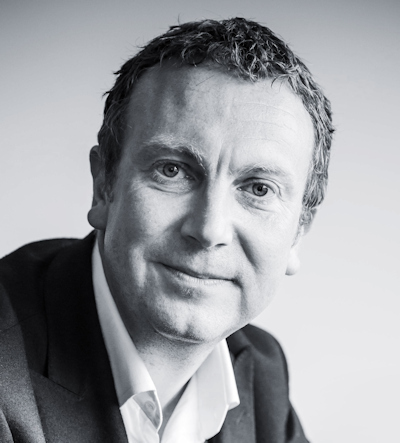 The coming year is forecast to be another strong one for the global ultrasound market, although the regional distribution of growth will be quite different. The EMEA market is forecast to grow faster than in 2018, on the back of stronger growth in Western Europe as a return to growth in the French and Italian markets, improving market conditions in the Middle East and Africa, and sustained growth in Eastern Europe. Conversely, slower growth is forecast for the Americas market, with both the North American and Latin American markets forecast to grow more slowly than in 2018. The Asia market is forecast to grow at a similar rate as in 2018, with a recovery in Japan and faster growth in India compensating for a slowdown in China. The comments and observations expressed do not necessarily reflect the opinions of AuntMinnieEurope.com, nor should they be construed as an endorsement or admonishment of any particular vendor, analyst, industry consultant, or consulting group.